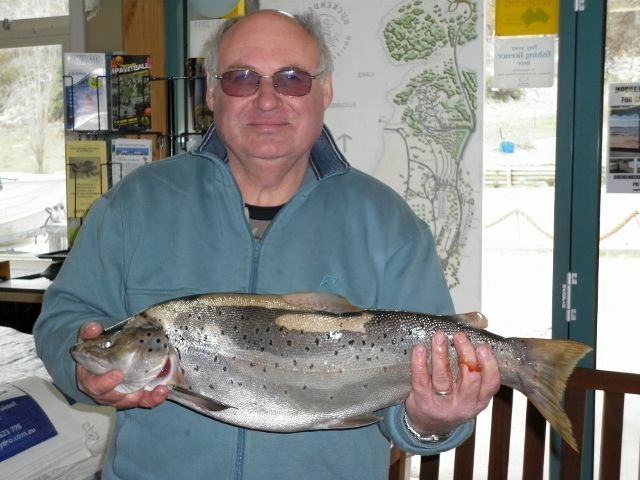 The rivers are finally open and plenty of fish to be found on the rivers and lakes and the reports are flowing in. We are stocked up with bait Mudeyes,Grubs,Scrub worms & powerbait for the school holidays. With the opening of the season over the last week we have not had to many reports from the lake anglers this week its all been the rivers on the fly. But last week the following happened, The lake has been fishing really well and numbers of fly reports are coming in. With the lake level as it now you can expect to have plenty of fish in close feeding fairly well. 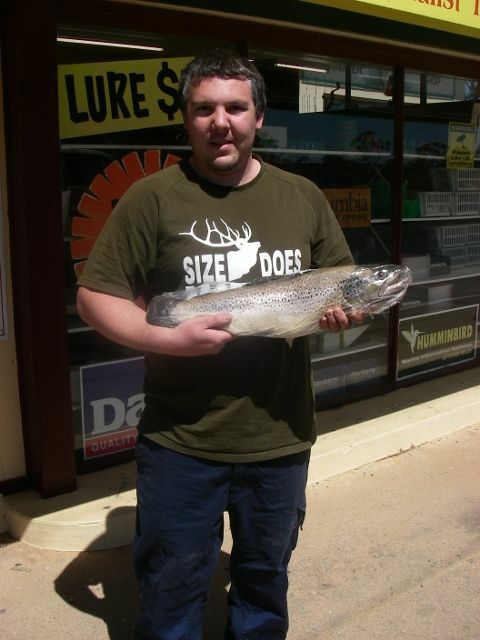 Some anglers have been reporting of 30 fish in a single session over the afternoons in East Jindabyne area. 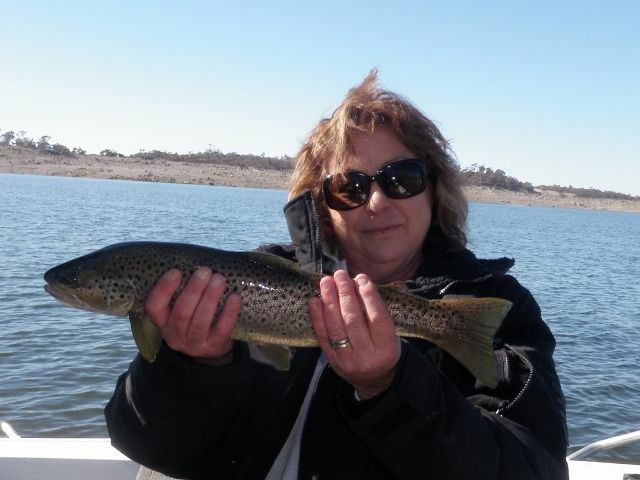 The Thredbo was in fine form as many anglers found out. Here we have Daniel Csillag with a nice 2lb Rainbow Trout on glow bug. Best fly s at present are Mrs Simpson brown ,Mrs Simpson olive. Woolly buggers Olive & Black, B/H Nymphs black, Fuzzy Wuzzys, Williams Goldfish. On lake Eucumbene it had been really good fishing once you pick the right weather for it. With the lake rising so fast it you have plenty of areas to hide in. Most reports are coming through from Providence Portal, Anglers Reach, Old Adaminaby, Seven gates, Frying Pan, Buckenderra. It shows the lake is really starting to fire up and with the opening of the season we are expecting great times on the lake. Fly s that are performing well are Mrs Simpson Brown, Mrs Simpson Olive, Woolly Bugger in Black and Olive. Bead head Nymphs in Black and Olive. Jay Allen and family had a good day out on the lake making the best of the conditions. Fathers and son combination of Peter & Lachlan Hatch had a great morning session on the lake with young Lachlan taking a monster of a rainbow 2.6Kg on Tassie Devil #89. Good to see you keeping your dad on his toes Lachlan. The stomach was full of yabbies and with great condition of the fish it is going to be a good year on lake. 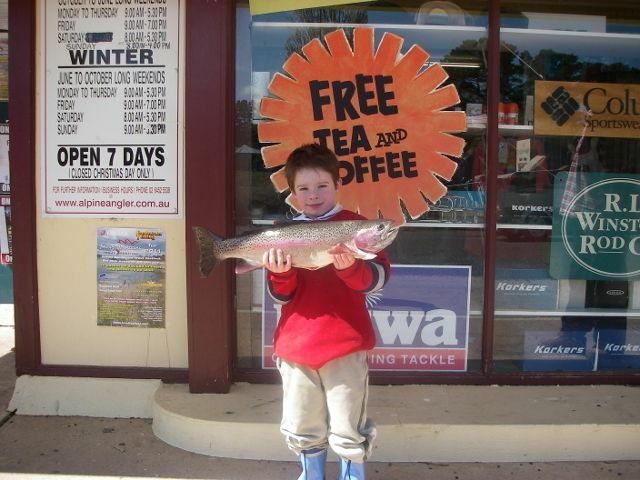 There are still some good fish to be caught throughout the lake and with many families coming up to Jindabyne for the school holidays it is a great time for all. 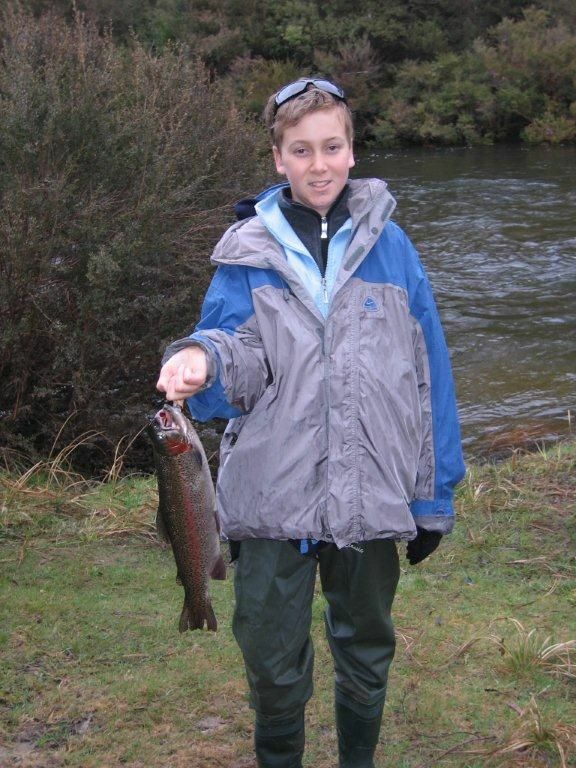 Lachlan with his fantastic Rainbow Trout. 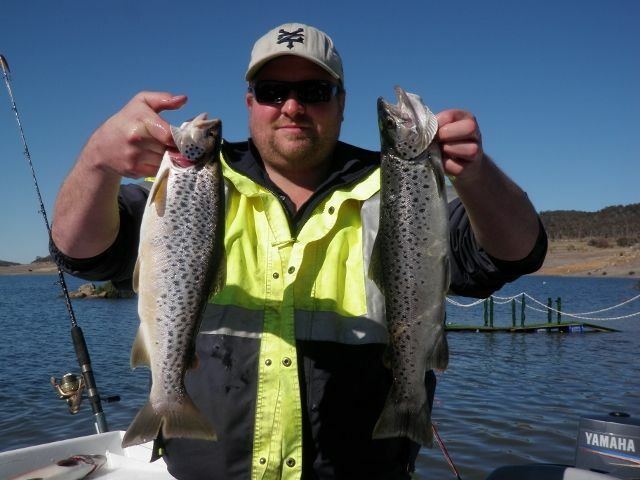 Anglers are really happy with the way Jindabyne is fishing of late. The fish have been caught on Power bait under scrub worm and some reports show mudeyes are coming in to the swing of things. If the weather allow if you cannot go past a worm under a bubble float and hold on as the big browns take off with it. 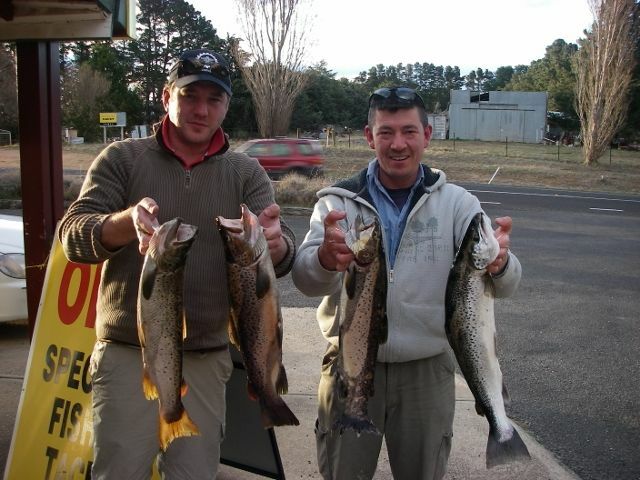 Some lucky anglers with nice browns from Jindy. It may have been a wet weekend at Buckenderra but this did not dampen the enthusiasm of the fisherman we were busy and some good fish caught. Trolling has picked up most being caught close to bank and amongst the trees, various Tassie devils red and black, white and yellow wings with red spots done very well, weights were from 500gm to 1.4kg for the rainbows and our largest brown was caught by Gary Woods on a 52 Hornet weighing at 8lb 7oz.Loftys and rappelled were also getting nice browns. We had the Stephens camping and they caught 6 brown and 3 rainbow all on scrub worms. Fly fishing was tough with Mrs Simpsons and various nymphs being used. Power bait was very successful good browns on orange and chunky cheese done really well with a lot of rainbows caught. I will send photos separately.